I noticed something unusual in my website statistics this morning. 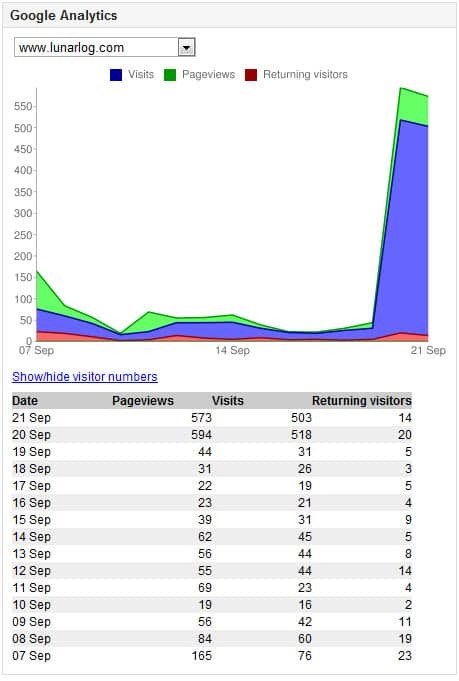 Traffic to this blog had jumped from around an average of 50 visitors a day to almost 600 visitors per day since September 20th. I’m still trying to figure out what exactly caused this spike. The only other times I’ve seen larger spikes is when some of my work was featured on NPR, The Atlantic, Gizmodo, and The Wall Street Journal. 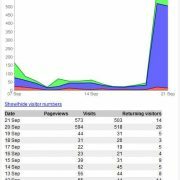 The numbers had jumped close to 8,000 visitors per day then dropped back down. A traffic increase is a positive thing for any concerned author on the Internet as long as it doesn’t crash your website hosting service provider. The whole point of running a site in the first place is for people to find what you are writing about or promoting. So, there’s no complaints on my end – I’m just trying to figure out what exactly happened because I’m really curious. I tried looking at my logs and couldn’t pinpoint where visitors were coming from and what they were looking at. Relatively-speaking, this site isn’t meant to be popular and the traffic spike isn’t anything remarkable compared to some much larger and more popular websites. I don’t think (nor would I ever intend) that the topics I choose to discuss here would be interesting to most people. It’s meant to be informative for people searching out specific needs and design-related information, while attempting to cross-promote my artwork at LunarStudio.com. I tend to focus more on smaller niches of writing and uniqueness of content, rather than some other blogs which try to tackle one major topic (ie. food-related blogs, motorcycles, etc.) A slight diversity in topics seems to cast a much wider net when it comes to search engines, although specificity also has its own time and place. I suppose what you choose to write really depends on what you want from a target audience. My main work is illustration-related, and it’s such a broad field that work can come from any number of directions. The redesign of Lunarlog which could have led to faster load times, better code syntax, and a more pleasant experience to end-users. A link from a popular website to this one. A link from a popular website which contains a popular article to this one. A popular topic which I might have recently written about. Removal of some WordPress plugins. Addition of some WordPress plugins. In general, traffic spikes usually come from one or two resources, but other sites might pick up on something interesting and start linking to you as well. Spikes and traffic acts like a pyramid when it comes to linking, but hopefully this remains a plateau. It might be a few more days before I can come up with some solid answers.